It’s the middle of August and most of us are not thinking about our strawberry plants, but you should be! It’s time to fertilize. As you may recall, we planted a new strawberry bed this past spring. I’m happy to report that the strawberries have been sending out runners (they are also called daughter plants) and are growing well. Periodically, I see the girls looking under the leaves for strawberries. I remind them that we have to wait until spring. How disappointed they would be if there were no strawberries after waiting all of this time. Since I am a mom who doesn’t like to disappoint, we are going to fertilize. As the days get shorter and cooler, strawberry plants develop their fruit buds for next year’s crop. To maximize this growth, it’s important for the soil to have an adequate amount of nitrogen, phosphorus, and potassium. Just like when my daughter was getting ready for a t-ball game on a hot summer evening, I knew she would need carbohydrates and plenty of water to get her through the game. I realize it’s just t-ball, but I didn’t want her to run out of steam before the game was over. Fertilizing in August provides the essential nutrients my prized strawberry plants need to grow the fruit buds that produce mouth-watering strawberries next June. 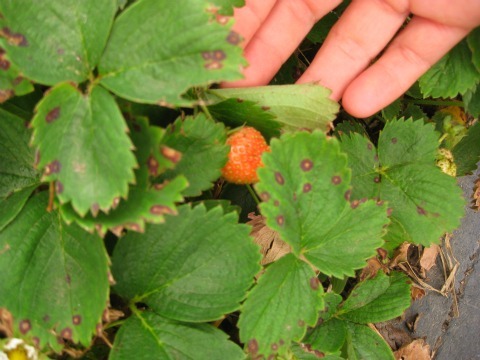 Specifically, strawberry plants rely heavily on nitrogen. You can use a fertilizer containing only nitrogen such as urea (46-0-0) or ammonium nitrate (33-0-0). Another option is to use a balanced fertilizer such as a 12-12-12. To get the fertilizer in the soil, where the roots can absorb the nutrients, I gently break up the ground with a hoe and make a trench. Once the trench is made, I put the fertilizer in the trench and then cover it up with soil. Whatever fertilizer you choose, be sure to follow label directions and apply at the right rate. A little bit of work now will yield larger strawberries and even bigger smiles on my girls’ faces!